Taiwan Duck and its excellent step-by-step video on how to cook (and flip) the oyster omelette. Mrs. Duck—okay, fine, her name is Joanne—is kind of adorable. Taiwanese Cooking and its lovely “Starch 101” with their delish oyster omelette. Browse these sites at your own peril. Recipes such as Lotus Seed Dessert (loved this as a kid) and Sesame Oil Chicken (“muah yu gei” 麻油雞) will have you inexplicably saving food photos onto your desktop like some sort of reclusive hoarder. Also, shout out to TA.org’s Julienne Lin and her savory take on the oyster om! 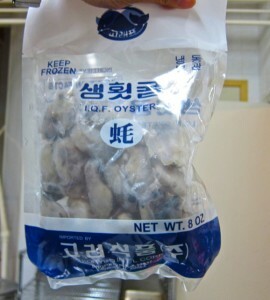 The “Made in Taiwan” sweet potato starch (left) and the Korean brand of frozen oysters (right) should both be easy finds at the Asian mart. 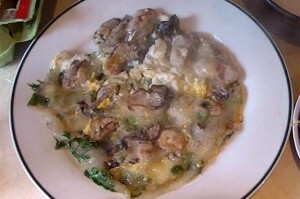 Freshly shucked oysters are great, but just in case you wake up Sunday morning with oyster omelette cravings (because who doesn’t) … salt these in a bowl and rinse to defrost. Public service announcement: The above merchandise photos were provided for those who remain solely familiar with the candy aisle of the Asian supermarket. You know who you are. I see you there, Hi-Chew. Per the above recipes, there is some fascinating variety and nuance in making the Taiwanese oyster omelette—from the mix of tapioca and/or sweet potato starch to the type of greens (spinach, napa cabbage, etc.) 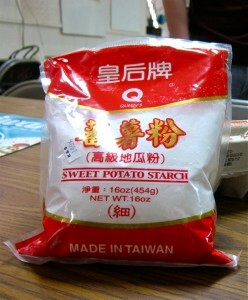 and the choice of ingredients (fish sauce, sour plum powder, etc.). Enough nuance for an academic essay and a Ph.D in omelette, really.